I don’t think it was totally unexpected. The only reason he lasted this long was due to injuries from Robles and Kendrick, but he’ll be a decent player with consistent playing time. I unexpected people commenting that it was expected and bickering that it was unexpected. “AB eater” like in the innings eaters in pitching? Usually code word for a veteran that eats up innings and bad ones at that, based on his career numbers he’ll be eating up ABs with little return. I expected that something unexpected would happen, but never expected this. I’ve heard of inning eaters for pitchers, but never AB eaters. I like this for both sides. Goodwin needs more playing time and he could wind up being a solid player, and the Nationals get a young reliever with insane minor league numbers for an outfielder they couldn’t give playing time to. Not crazy about this for the Royals tbh. Goodwin seems to be underwhelming or average at best. Giving up any youth, especially one showing signs of promise, doesn’t seem wise for their current position. I’m not one for hoarding prospects but Goodwin doesn’t seem like the guy to give anything up to get. I think you will find that Goodwin will be a very good everyday player. If he could get 135 games to play IMO he will hit .265 15 home runs 15-20 stolen bases and a very solid outfielder. 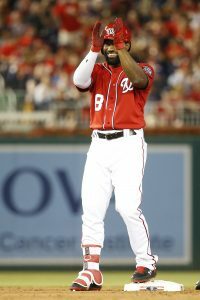 Are the Nats throwing in the towel? It’s a legitimate question. This overpaid underperforming team is under.500 and in 6th place for the wildcard spot. Not yet, but maybe soon. Harper and the offense needs to step up quickly. I think it’s fair to say the Nats are the best mediocre team in baseball this year. The roster is loaded with talent from top to bottom, but it’s not translating into wins. They can still turn it around, but that requires scoring considerably more runs than they have in the past 3 months. They’re only 6 games back in the division with 60+ games left. They traded a rarely used OF and got back a high upside arm. That’s definitely flying under the radar. Royals going on a run? If they are then Harper becomes available and could have tryed to get like Duffy to. Nats fan here. Good luck to BGoody. He’s had some good spurts when he got playing time and can adequately play all 3 OF positions. He was never going to get consistent playing time for the Nats with our OF logjam, so I hope he can prove himself on the Royals. I suspect he’ll become an average major league OF if given time. I think this trade was mainly to make some room for all the pitchers the Royals drafted last month. They still have players in Surprise waiting to be assigned. As promising as Bogan is..the Royals have tons of younger pitchers that need to pitch somewhere. I think Goodwin will spell the end of Paulo Orlando’s Royals career. He’s been atrocious since his breakout season 3 years ago. As with most Dayton Moore trades, this is just plain sickening. Jacob Condra-Bogan is just 23 years old and has some insane numbers in A ball. in 21 inning just 21 hits, 40 strike-outs and 3 walks. His fastball is 100 MPH. And in return we get a 27 (close to 28) year old butcher of an outfielder who’s BA is .200. Figures right into other Dayton Moore trades….old untalented for younger players with great upside. BGoody isn’t a butcher in the outfield. He’s pretty decent (not great). And he’s streaky at the plate, so this thing about getting 3 ABs/week didn’t work well with him. He has a chance to be decent for you guys. The sky is falling…the sky is falling…for gawd sakes Moran, relax. Overreact much? Goodwin is an in season veteran pickup that will be likely moved next summer IE Jon Jay and Duda. Until then he will get plenty of playing time to establish some value. Bogan has upside but he was signed out of the Frontier league and the Royals have a slew of younger pitchers coming. Say what you will about Dayton’s first round picks and the well documented struggles – but his trades work out in the Royals’ favor the majority of the time. His worst trade was the Cahill/Maurer/Buchter trade last summer, but outside of that what trades haven’t you liked? David for Solar looked bad at the time and worse now. They could have gotten multiple decent-good prospects for him, instead they got a single guy with a history of not playing and not performing well when he does. We traded one year of a reliever who’s elbow had been balking for five years of a guy with MVP-level potential. Soler obviously has been frustrating with the benefit of hindsight, but there is still time for him to make good on his talent. He’s only 25 and has two more years of team control. Mvp potential? Ok lol. Royals were in a tough spot with that trade. They needed payroll flexibility and needed a everyday player back for Davis. Thought the trade at the time was ok obviously in hindsight if your the royals you who have preferred prospects. You just said it was sickening that we traded a guy we signed away from the Long Island Ducks for a guy who’s floor is a 4th outfielder? I think you need to spend some time breathing into a paper bag. Good luck Goody! Has the potential to be a solid major league player and is one of the nicest and genuine guys you could ever hope to meet. Hope he has a good career out in KC. Intriguing arm the Nats got in return. Could be a great trade for the Nats down the road. The Royals are buyers! They’re in on Machado and Familia! Should have traded Harper and his negative WAR. Why use facts when you can just spew misinformation out as fast as you can. What a world we live in. No better guy to give regular ABs to as a rebuilding team. Will be nice to see what kind of player he is, he’s shown quite a bit of both good and bad so far, super tough to figure out with like 8 players in front of him though.